Jim helped us deliver our new Legacy from Newburyport to Portland. We are power boat novices and were un- familiar with the boat. Jim was extremely knowledgeable, organized and safety conscious which gave us a lot of comfort. Not only is he a competent professional but his easy going personality made the trip a pleasure. We are looking forward to working with Jim again soon as he helps us get to know our new boat better. Thank you Jim! As the owner of a new boat, I wanted some help to climb the learning curve on my first sail. I hired Capt. Jim Vander Schaaf to sail with me on my new boat from Maine to Connecticut. Despite some problems with the boat, it was a great trip, enjoyable, safe, educational, confidence building. Jim was professional and helpful long before we left the dock. He was a great organizer, leader and companion on a 4 day run. I won`t hesitate to recommend Capt. Vander Schaaf to any friend who needs their boat delivered, whether as an owner on board or as a straight delivery. I hope to sail with Jim again in the future. 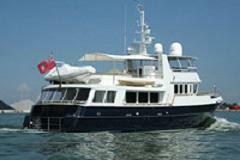 What can I say about Downeast Yacht Delivery Services? 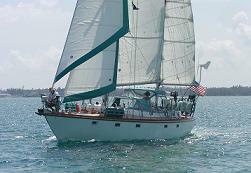 What a great job Captain Jim did bringing my 1978 Pacemaker 40 to Savannah, GA from Essex, MD. We had several last minute date changes followed by some mechanical issues delaying departure. Through it all Captain Jim and his crew were pleasant and understanding never putting pressure on us to get underway faster. The boat was leaky and drafty, more than I realized until I moved aboard this past weekend, and the weather was at times unseasonable poor. Captain Jim did a fantastic job communicating what was going on during the trip and how the boat was performing. He took care of some small minor repairs along the way and graphed engine fuel consumption finding the most efficient running rpm. Downeast was budget conscious and took measures to save money by anchoring out most evenings. I am sure when I am ready to upgrade in a few years, Captain Jim and Downeast Yacht Delivery Services will be my first call for delivery assistance. They should be yours too! I highly recommend Captain Jim Vander Schaaf to anyone looking for a fine delivery captain to transport an important vessel a long distance. And if you want to learn a thing or two in the bargain, all the more reason to hire Captain Jim and benefit from his font of knowledge, skill and experience. How do I know this? Captain Jim sailed my Ericson 36C from Deltaville, Virginia to Portland, Maine in August/September 2014. I accompanied him for three days on the Chesapeake. He also gave my family a useful lesson in safe boat handling, man overboard procedures and seamanship for another day along the Connecticut coast along the way north to Maine. Captain Jim's strength as a captain stems from an extraordinary combination of his training as a naval architect educated in Ann Arbor and designing vessels; his thousands of miles under keel at the helm of his own large cruiser for years; his many journeys under power and sail plying the East Coast of the U.S. and the Caribbean, among other waters; and his skilled and spirited crew member, Marielle Vander Schaaf. Captain Jim is a seasoned and strong hand at the helm, an excellent mentor and advisor, a veritable Mr. Fix It when the inevitable minor failures of any boat crop up, and a charming and pleasant gentleman with whom to share a voyage. Please feel free to contact me as a reference, without any reservation, for Captain Jim at my email at gphansel@gmail.com. I would recommend Capt. Jim to anyone who wants a truly personal and caring individual to deliver your prized possession to any destination you choose. I believe Capt. Jim has had many adventures with the sailing crowd, and our trip from North Palm Beach FL. to Westbrook CT, was one of his first power boat deliveries. His ability to adapt to a different style of cruising was impressive. His ability to teach without actually making it a lesson will never be forgotten; you learn from just being there! I hope someday to make the journey with Capt. Jim again sooner rather than later. Once on the sea, Captain Jim proved to be a natural born teacher. His enthusiasm and love of sailing shines brightly and was contagious. He provided us lots of hands on experience, as well as instructional talks and what if scenarios. He pulled out a hand-bearing compass and had us determine our location on our chart based on triangulation, something I had not done since my college days as a geography student. It was such a relief to know he was traveling with us and teaching us as much as we could handle about safety, navigation, radio communication, and sailing the north Atlantic. 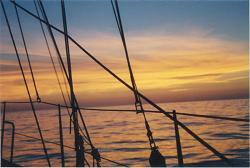 There is an easy gentle spirit that Captain Jim shares with his crew. He encouraged us to ask lots of questions and his real life experiences gives him the knowledge that one can only gain insight into by having lived it. Captain Jim was able to see each crew member for the skills and strengths that they have. He is able to draw on these strengths and pull out new ones that you never knew you had. Steering the vessel was a duty we all took part in. Captain Jim was quick to complement me on my natural ability to steer by instinct. It felt so good to hear a sincere complements from our captain. Being the only woman aboard I was worried about not being able to pull my weight, whether that be hoisting the sails dropping anchor or driving. Never once did I feel that I was not appreciated: it was quite the opposite. Captain Jim is a true gentleman, with a wonderful sense of humor and respectful to the needs of the group. Many a jokes and stories were told by all and Captain's Jim wit his Maine accent when he told his "Burt and I" jokes were hilarious. At the end of the days we sailed, we would sit around after dinner and talk about the day. We would rate the day and discuss what we learned and what we wanted to learn the next day. These times sitting around the cabin table were some of the most beautiful times we shared. Captain Jim encouraged us to really share our feelings, emotions about the day and the journey. He was very willing to give us the freedom to make mistakes as long as they were not dangerous ones. As each day passed I gained more confidence and expertise, our crew was really working together and soon our captain was proud. I would highly recommend Captain Jim to join anyone that is in need of a patient and gentle Captain to deliver their crew and boat safely, efficiently and in the most enjoyable manner. His skills, ability to teach and communicate are top notch. He is honest and a man of his word. He is extremely organized and will go the extra mile to make your journey one that you will always treasure. It is hard for me to put into words all the wonderful things that this man did for our voyage. A once in a lifetime, first voyage on the Coaster II and we were fortunate in finding a Captain who not only loves to teach, and has many, many years of experience but also has a warm, happy heart that gave this journey a blessing and compatibility that will last for a lifetime. Nick, Jill and Thanos were taught many of the special techniques of sailing this vintage schooner, but also found a Captain with a heart that has traveled many journeys in a personal way. He has a gift of drawing out the inner feelings of the crew and bringing out the best of each one, making it a journey not only of sailing the seas but also one of personal growth and accomplishment. You would be fortunate if you could retain Captain Jim for your next adventure. I recommended that James R. Vander Schaaf be approved for a Coast Guard Master's License. In the time that I have known him (over 40 years), he has demonstrated that he has the character to act in a trustworthy, responsible and safe manner in performing the duties required by the licensed position of Captain or Ship Master. We have sailed with Captain Jim for several days on a 38 ft Catamaran in St Vincent and the Grenadines and were delighted to spend this time with him! He's most knowledgeable and a joy to be with! I can't believe your dream is actually coming true! It makes me incredibly happy to see you doing what you've always wanted to do. I love you for your passion of adventure and following your deepest hearts desire. I love you with all my heart and soul and I will be there eventually right along side you. bon voyage! We'll all live our unencumbered, vagabond fantasy through your travels - you deserve to live out your dream. Good preparation seems to make good luck happen! On a final note, I would like to recognize the contribution that Jim Vander Schaaf made to the SG&I 100 day plan. Jim has worked with Intergraph for the past 10 years on various reengineering and change management projects. The expertise that Jim has brought to Intergraph in the areas of group facilitation, change management, strategic planning and team building has been enormous. He has helped SG&I discover it's Vision and unleash the power of an aligned team.